Shillong has been news with the Supreme Court telling the Kolkata police chief to appear before the CBI in this hill station of Meghalaya, which is over 700 km from Kolkata, for questioning in connection with chit fund scams. That being so, all eyes will be on Shillong in the coming days, given the political interests. But, barely a 100 km from this 'Scotland of the East' is East Jaintia Hills where 15 poor miners have been trapped inside a flooded illegal rat-hole mine since December 13, 2018. This news would have died down and rescue operation called off long ago but for the Supreme Court's intervention invited by advocate Aditya N Prasad. On January 11, almost a month since the tragedy, the apex court asked the governments to keep up with the rescue operation for "miracles do happen". By now, Indian Navy divers have detected the body of one of the 15 miners which could not be pulled out by the ROV (Remotely Operated Vehicle). Prasad's petition and the status reports filed in its response show that the rescue operation was no more than a recovery operation from the start and crucial time was lost with men and equipment, including heavy-duty pumps, being moved by road, state's failure to seek help from various agencies in time and requisition of the Army and the Air Force in a logistical support capacity and the hesitation of the Central government in providing the same for want of a formal request. The glaring loopholes and lack of coordination among agencies throw light on the pressing need for a standard operating procedure for rescue in mines and other similar conditions, as has been prayed by Prasad in his petition filed following newspapers reports that the rescue operation was suspended due to the inadequacy of water pumps. On December 27, when the Supreme Court was on vacation, advocate Aditya Prasad sent a petition via post to the Chief Justice of India, as the registry refused to accept the writ petition citing lack of urgency, seeking urgent direction to the Centre, Coal Ministry, the Ministry of Defence, Meghalaya government, Coal India Ltd and the Ministry of External Affairs to procure high-power pumps from Pune-headquartered firm Kirloskar Brothers Limited and airlift them to the site rather than suspending rescue work. 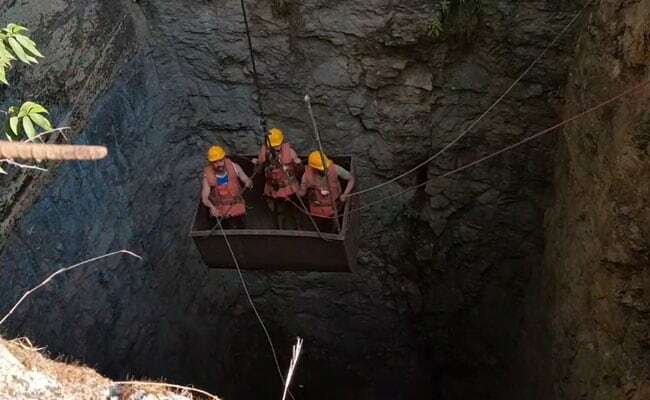 It is interesting to note here that while the rescue operation in Meghalaya was being suspended for want of adequate pumps, India had offered Kirloskar pumps and technical know-how from the company in the rescue operation of a football team trapped inside a flooded cave in Thailand in July 2018and the same had proven of great help. On January 2, the court reopened and the matter was taken on record upon urgent mentioning by senior advocate Anand Grover and listed for January 3 when the court asked Solicitor General Tushar Mehta to apprise it of steps taken to rescue the miners. From January 3 to February 5, seven dates have passed. The Centre and the state have filed their status reports which only reflect an utter disregard for time and lack of will. Post the Supreme Court hearing on January 11, when the court hoped for some miracle to happen, the hydrologist at the National Institute of Hydrology, Roorkee, was directed by the MHA to proceed to Delhi by road on January 12 and then take a commercial flight to Guwahati. This is when both the National Institute of Hydrology and the Geological Survey of India have their regional offices in Shillong, but were never taken into the picture by the state. The petitioner personally requested the Geological Survey of India to assist the hydrologist when on site. Having suggested that an ROV can solve a lot of issues, it was the petitioner who contacted Planys Lab in Chennai for providing ROV and upon receiving confirmation, asked the state government to send a formal request to the company. Citing the absence of a map for the mine being a stumbling block in the rescue operation by the state, Prasad got in touch with the National Geophysical Research Institute, Hyderabad, which accepted to help and send their ground penetrating radar and other equipment to the site to help identify the underground shafts invisible to naked eyes. That is not all. On January 11, it was after Prasad contacted the Additional Chief Secretary (Disaster Management, Government of Meghalaya) that the teams concerned were awaiting airlift that the state made a formal request to the MHA and an IAF aircraft airlifted the ROV team from Planys Labs, Chennai, and halted in Hyderabad to pick up NGRI team and landed at Guwahati Air Force Station at 1400hrs. From here, all teams were directed to move by road to the operation site despite a helipad being made at the site. Once again, due to inadequate transport, a part of ROV team stayed back and waited to load the equipment. The teams reached the rescue site only on the next day around 2 pm and were later accommodated in a Guest House, 75 km away rather than in some in-situ accommodation and lost at least four crucial hours travelling to and fro everyday by road and left with only few light hours to work with sun setting in the region at 4 pm. Meanwhile, the CEO of Planys Lab wrote to Meghalaya government about the requirement of SONAR at the site and suggested that the same be airlifted from the National Institute of Oceanography, Goa, and brought to Chennai for interfacing it with ROV software and then taken to Guwahati. There was no response from the government. Prasad then sent a request to Indigo Airlines to airlift SONAR and received a nod. Meanwhile, he also wrote to the Geological Survey of India for providing assistance to hydrologist at the site, to which he received a confirmation that the regional office at Shillong would be sending a team on January 15. Due to mismatch in the timing of Indigo flight, SONAR was finally lifted from Goa by DHL on January 14 and it reached Chennai at 2300hrs and calibrated overnight at Planys. It was then airlifted by an Indigo flight to Guwahati. The petitioner contacted Pawan Hans for lifting the SONAR from Guwahati to Shillong and was informed that any such request should come from the state, as they were operating sorties on their behalf. On January 15, Prasad sent out a tweet to the Minister of Civil Aviation seeking assistance in transporting SONAR to Shillong but met with no luck. He then made a telephonic request to Additional Deputy Commissioner, East Jaintia Hills, that the SONAR be received at Guwahati airport and finally it reached the site. By January 18, the hydrologist returned to Roorkee after giving a detailed de-watering plan and making vital corrections to the pumping. Despite that, the state did not take any steps to put the plan into action. Amidst all this, the SG has assured the Supreme Court that the rescue operation is not being called off. The matter will now be heard on Friday. Prior to the matter reaching the apex court, status reports show that it was only on December 15 that Coal India Limited (CIL) came into action. Four of its employees were sent to the site from north-eastern coalfields and returned on December 18 assuring the district administration of all necessary help, whenever required. However, it was much later, i.e., on December 26, that Additional Chief Secretary to Meghalaya government requested the Chairman, CIL, for assistance and requirement of submersible pumps and other equipment. Even when locals spoke of chances of survival of the miners in case they have found a vertical airy gap, no urgency was shown to rescue them. On December 27, Bharat Coking Coal Limited (BCCL), a subsidiary of CIL dispatched two sets of submersible pumps and a team of six persons left for Guwahati by road, reaching there on December 29, visited the site only on December 30 and started preparing the site by January 2. The team from National Disaster Response Force (NDRF) also came into the picture but its personnel are trained for flood-related deep diving rescue operations upto a depth of 25 feet only. The state government requested the MHA for 10 high-power trailer pumps and the same were airlifted by the Indian Air Force from Bhubaneswar airport to Guwahati airport. It was only on December 29 that a team of Indian Navy divers left for Guwahati and reached the site on December 30 along with an ROV. Meanwhile, in a separate status report, the state government cited complete unavailability of electricity in the nearby area due to which generator sets had to be brought in to operate pumps. It also said that "Material required for setting up high powered pumps are also not available in the district and even in whole of Meghalaya". Despite such shortcomings and repeated suggestions from the petitioner, the state did not seek help from the Army. The report also talks of locals suggesting pumping out water from each mine simultaneously. While representatives from Kirloskar Brothers inspected the site on December 27, it was only on January 5 that the pumps from the company were operationalised, due to lack of infrastructure. From December 28 to December 29, a helipad was created at the site and the Navy's ROV arrived by helicopter, but other rescue teams and equipment continued to be taken to site by road. Despite the helipad being available and lack of infrastructure with the state to install the high capacity pumps, no request was made to the Army engineers for help. In fact, the Navy requested the Army for setting up an in-situ camp for its team – and the same was done last week – so that rescue operations could continue round the clock. The matter raises a larger issue: whether in a case of lack of infrastructure for rescuing citizens and the "Will" to procure the same, which is all dependent on formal requests, preclude the citizens of India trapped in a life-threatening situation from the protection given under Article 21 of the Constitution of India. All eyes are now on the Supreme Court hearing scheduled for February 8.